As in the CAP program, CUPP companies broke down into squads, each of which was paired with a RF or PF platoon to protect a particular village. The company headquarters, usually located near the headquarters of the district in which its squads were stationed, performed many of the functions of a CACO. 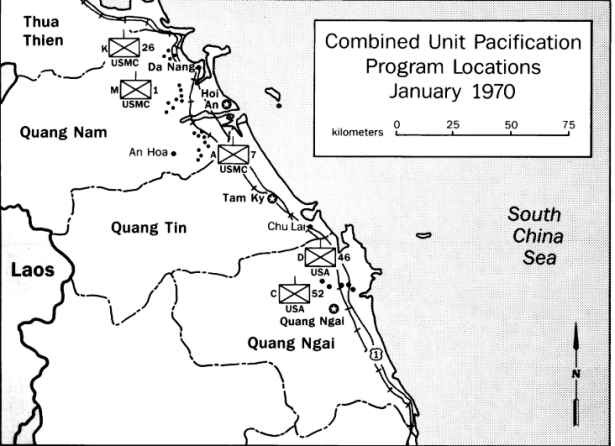 Each CUPP squad had the same seven missions as a CAP, centering around territorial security and training the RF/PF, and the aim of the new program, as of the Combined Action Program, was to merge Marine firepower and military skill with the militia's intimate knowledge of the local people and terrain. along Route 4 where it passed by the foot of Charlie Ridge. In March, the redeployment of the 26th Marines and its accompanying realignment of regimental TAORs brought changes in CUPP organization and control. The 1st Marines on 6 March transferred operational control of its Company M to the 5th Marines, which had expanded its AO to include the villages around Hill 55 where most of the company's squads were stationed. At the same time, the 1st Marines absorbed the personnel of the 26th Marines CUPP squads and concentrated them for defense of two of the four hamlets initially protected by the departing regiment. These rearrangements left the 1st Marines with three CUPP squads under its direct control: the two inherited from the 26th Marines and one squad from Company M in the AO of the 2d Battalion, 1st Marines. The 5th Marines now had its own Headquarters Company CUPP Platoon and Company M from the 1st Marines, while the 7th Marines continued operations with its Company A. By the end of April, the 1st Marine Division had 22 CUPP squads protecting some 23, 000 villagers and working with 16 PF and 7 RF platoons and over 500 armed PSDF. Most of the CUPP teams were located in villages along Routes 1, 4, and 535 or around major allied bases, such as Hill 55 and LZ Baldy. Unlike CAPs, which usually protected villages more or less friendly to the allies, most of the CUPP squads occupied communities under strong Viet Cong influence. Of the nine hamlets held by the 7th Marines' CUPP company, for instance, eight had C and D ratings under the Hamlet Evaluation System and the remaining one was acknowledged to be VC controlled. The combined unit pacification companies underwent another reorganization in September, as the 7th Marines redeployed in Keystone Robin Alpha and the 5th Marines took over its TAOR. On 7 September, Company G, 2d Battalion, 5th Marines relieved Company A of the 7th Marines in its hamlets along Routes 1 and 535. The 5th Marines' company incorporated over 50 percent of the men of the 7th Marines CUPP unit. Two weeks later, as the 3d Battalion, 5th Marines turned the Thuong Due corridor over to the 1st Battalion, 1st Marines, the latter regiment resumed operational control of its own Company M and also of the three 5th Marines headquarters CUPP squads along Route 4.
knowledge of the area. But, in reality, it was the reputation of the company itself that prompted the selection. As you can see it was a major program that continued after the 26th Marines left. It was not the CAP. I went on to command two CAP companies, and it was similar but often quite different, as many of my Marines spoke Vietnamese. I thought the official explanation would be of use to those that might have questions.